If your car makes any strange noise, it could be your vehicle’s exhaust system that is malfunctioning. 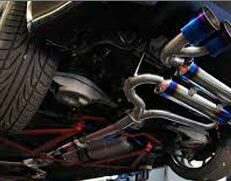 The exhaust system is supposed to minimise the noise and reduce harmful emissions from your vehicle. Whether you drive a car or a truck, your vehicle has an internal combustion engine that allows harmful gases pass through pipes so you will not have to breathe in them. Proper working of your exhaust system is not just important for safety but also to help your engine maintain good mileage and performance. We provide car exhaust repairs & all mechanical repairs in Hawthorn East, Camberwell, Kew, Balwyn, Canterbury & nearby suburbs. At Bob Watson Service Centre, we have a team of certified mechanics who can handle the all car service & repairs and maintenance of your exhaust system. We are equipped with the state of the art equipment and complete training to properly service exhaust systems on vehicles of both foreign and domestic makes. Why You Need Exhaust Repair? The exhaust system in your vehicle helps in monitoring, filtering and protecting your engine. Ignoring any complication with this system will turn minor problems into major ones, and even affect the overall performance of your vehicle. That’s why it is recommended to have your exhausted system inspected thoroughly as soon as it shows the first warning sign. When you hear a loud noise from the exhaust as you accelerate, it could be the sign of an engine leak and exposure to harmful gases. Increased fuel consumption is a sign indicating that something is not right with your vehicle. Rattling noise or vibration from the gas pedal or steering wheel is an indication of broken or loose muffler parts. Burning smell is often caused by a hazardous exhaust leak. When you bring in your vehicle for exhaust repairs, we will inspect, repair or replace the following components. If you experience any of the warning signs of exhaust system problem, you can approach the experts at Bob Watson Service Centre for a thorough inspection. Call us at 03 9882 2451 to schedule an appointment today.